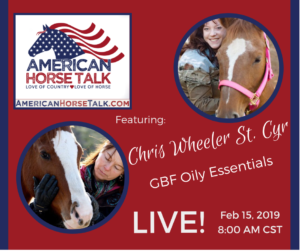 Watch Chris Wheeler St Cyr of GBF Oily Essentials tell her horse story on American Horse Talk LIVE on February 15, 2019, at 8:00 AM CST. Chris will tell us about essential oils for horses. Set your reminders and don’t miss out! To comment live, watch from the American Horse Talk Facebook PAGE. To join the livestream, download the BeLive.tv app. See YOU online!